A nineteenth century mindfulness guru called Gurdjieff once made a commitment to himself to be aware of everything he did for the next twenty-four hours. In the first hour of his practice, he went out to visit a shop. Along the way he watched each step and each thought and feeling. But somewhere on his trip, he lost track of paying attention. Only days later did he suddenly remembered that he had intended to be mindful. This guy eventually became a guru in the early 20th century history of meditation and mindfulness, but he couldn’t do it all the time. Often when we realize we want to change something about our automatic emotional responses or thoughts, we set out to change by constant vigilance. We might read books on mindfulness practices and try to apply them to the problem. Then, as so often happens in the course of living our lives, we miss an incident of the thing we wanted to change and beat ourselves up about it. We failed to be aware and make a better choice. And, worse, we failed to maintain our mindfulness. 1. It’s okay to fail. If you’re not failing, you’re not approaching the edge of your compitence or your comfort. Growth happens at the edge of your comfort zone. Boredom sets in if you spend too much time deep inside that zone. Growth, creation, and relationship are all most alive in the turbulence near the edge. 2. It’s okay to fail. The point of mindfulness is the practice not the perfection. As with Zen meditation, a great deal of the benefit comes from those moments when you consciously see what just happened and bring your attentio n back on focus. It feels hard because you are strengthening pathways in your brain. And this new strength will benefit you, not just in being mindful, but in being better able to focus and concentrate your attention in everyday life. 3. It’s okay to fail. You are a precious human being even after you broke that dish. You are fundamentally good and worthy of love and health and joy even if you snapped at your spouse again. 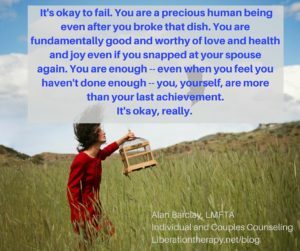 You are enough — even when you feel you haven’t done enough — you, yourself, are more than your last achievement. It’s okay, really. Compassion for yourself is the best companion for mindfulness and change. The safer you feel in yourself, the easier it will be to face those things that seem hard to change.